Writing about the Democratic People’s Republic of Korea (DPRK) is not an easy task. I can tell you about what we saw, what we did, express a few opinions and quote published facts but unlike most other countries, as a visiting foreigner it’s almost impossible to get the full picture. My account of our trip should be taken purely as a personal travelogue covering a few days on a carefully controlled tour where our itinerary was set for us. We’re certain that some of what we saw wasn’t real and at times it felt like we were in The Truman Show as things took place with just a bit too perfect timing. But equally we got to see plenty that appeared genuine, particularly from the bus as we travelled between places and there wasn’t a single day that wasn’t surprising. The full story of the DPRK is very complex and includes some dark chapters which are well documented elsewhere. For now though here’s our account of what it’s like to be a tourist in the DPRK. Flag oｆ Democratic Peoples Republic of Korea. After a brief briefing meeting in Beijing by the Young Pioneers Tours team we board the sleeper train for Dangdong. Over 200 people are traveling with YPT and hundreds more will be using several other tour companies either by plane or train. The Pyongyang Marathon weekend is one of the most popular of the year for visiting the DPRK so we’re warned that things might be quite busy. Back in March we entered China from Dondang in Vietnam so it seems fitting that we now leave it at Dangdong. After transferring to a different train we slowly roll across the river Yallo that forms the border. On the Chinese side sit huge apartment blocks, neon signs, busy traffic, on the opposite bank there’s a rusty ferris wheel, a factory, a few people in khaki on bicycles, dusty roads. We’re now in North Korea. The Friendship Bridge, leading to North Korea on the left replaces the old bridge on the right that was partly destroyed during the war. Before we can go any further the train is boarded by some stern looking guards in huge hats who’s main concerns seem to be whether any of us are carrying Bibles or cameras with a GPS feature. They soon lighten up when they find a copy of Cosmopolitan magazine (not mine) which requires further investigation by several of the other guards. 2 hours later, the checks are complete and we’re on our way again across miles and miles of brown landscape. It’s early springtime but nothing seems to be growing. The only colour comes from huge signs on the hillsides bearing slogans to motivate the farm workers. Portraits of Kim Il Sung and Kim Jong Il smile at us from every station we pass through, a sight that would become very familiar. It takes most of the day to trundle down to Pyongyang where the low village buildings give way to high rise apartment blocks. Despite being a city of 2. 5 million people there’s very little traffic. Instead trams and trolly buses are crammed with passengers and there are hundreds of people on ‘sit-up-and-beg’ style bikes. Sitting next to me is Tom who tells me it reminds him of his childhood in East Germany. It looks like a town from another era. Ryugyong　Hotel. Construction began in 1987 but it’s still unfinished. Apartment tower. All citizens are given a home that reflects their status. After a night in the newly refurbished Songak Hotel, where the lifts decide which floor to take you to regardless of which button you press, we’re up bright and early for the race. It’s been nearly 2 years since I last pinned a number to my chest and this will be Kirsty’s first ever half marathon so we’re both a touch apprehensive. In the enormous May Day stadium there are 150,000 seats and it’s over half full with conscripted spectators. It’s noticeable how drab their clothes are with khaki, grey and black the colours for this and every other season. We stare at them while they stare back. Although they’re here under duress it’s very much an unusual and interesting sight to have over 1000 foreigners in bright running gear to watch so it’s not a bad place for them to have to spend the morning. They even get some local football matches to entertain them while the race is out on the course. The May Day Stadium. The largest stadium in the world. After marching round the track for the opening ceremony we both get changed and ready but before we’ve had time to get back to the start line the starting gun fires. We chase down the surging pack of runners and we’re off! It’s one of the strangest races I’ve ever run. There are groups of people watching at various intervals but they watch us trot past in silence. There’s the occasional gasp or some stifled laughter from the children but there’s none of the usual cheering and applause. The hushed atmosphere is broken by a van driving round with ceremonial music blaring out and a message of ‘Welcome to our foreign visitors!’. On a hill overlooking the course two huge bronze statues of Kim Il Sung and Kim Jong Il watch the proceedings and look pleased. We run past massive and grand public buildings that house ice rinks, theatres and arenas. A hair pin bend brings us back past the largest triumphal arch in the world while groups of students perform synchronised semaphore alongside the road. By the second lap the crowd have warmed up enough for some light clapping and some say hello. I even get to high five a few children who have tentatively stuck out their hands. As well as the international field there are supposed to be 700 Koreans taking part. I try and encourage a few of the diminutive girls running alongside me but they don’t seem too keen to chat. Either too focused on the race or not wanting to get in trouble for fraternising with the tourists. I’m more than ready for the finish line when it finally comes into view, coming home a creditable 8th place. Kirsty comes in a bit later with a hard earned PB. Back in the stadium there’s controversy when the lead pair in the marathon arrive. At the front, a young man from Tanzania emerges from the tunnel and turns left to follow the timing car when he should have turned right to finish on the 100m straight. By the time he realises his mistake, the 2nd placed runner from DPRK has got past and goes on to take the win. The crowd go wild for their local hero while the Tanzanian is inconsolable and sits with his head in his hands by the finish line. Awards ceremony. The winners received huge vases that may or may not be possible to carry home. Once all the runners are in and the prizes have been awarded it’s time for food and refreshments. A Pyongyang favourite is cold noodles, served almost frozen and made from buckwheat. They go well with the makgoli rice wine to replace lost calories and fluids. Rehydration continues at a smart micro brewery later on. North Korean men are given a ration of 10 glasses of beer each month and can cash in their tokens on one of the 7 draft beers on offer here. There are no locals at the bar when we’re there though but it’s a chance to get to know our fellow travel companions who have come from all over the world. There’s a broad range of different travel experiences and all of us admit that we’d normally avoid a group tour at all costs, but we had to make an exception to be able to come here. It takes a certain kind of person to want to come to North Korea and as a result our group of 20 gets on really well. It’s mandatory to have an official tour guide with us at all times while in the DPRK who have undertaken extensive training to be able to handle foreign visitors and the strange questions they might ask. During our stay we’re being looked after by Miss Kim, Mr Pang and Miss Kim (50% of Koreans are called Kim). We also have Troy on board, one of the founders of YPT who has years of experience from visiting the DPRK and can try and answer the questions that we can’t ask the Koreans. He’s got a very full week planned for us to try and squeeze as much out of our stay as possible. Our legs have not enjoyed being made to run instead of cycle so stairs are an uncomfortable obstacle for the next couple of days. Luckily there’s not much walking as our bus takes most of the strain ferrying us from door to door for a tour of the city. Advertising is non existent and billboards display propaganda artwork rather than the latest mobile phone or car. There’s not much evidence of commercial activity either, other than a few pavement kiosks. We’re taken to get a closer look at the bronze statues of Kim Il Sung and Kim Jong Il on Mansudae Hill. It’s an uncomfortable moment for everyone when we’re asked to bow in reverence to the Great and Dear leaders that stand tall in front of us. It would be offensive to our guides and any Koreans watching if we refuse so a shallow dip of the head is a compromise we can just about live with. These statues are expertly crafted and come from a dedicated art factory that produces all the portraits, statues and propaganda for the whole country as well as many overseas projects. In fact the DPRKs number one export is it’s art with many African leaders ordering their own statues from Pyongyang. In accordance with the rules of the country, our photos have to include the entire statue from head to toe. Any photos of the many portraits of the leaders that we’ve seen on every public building must also be in full with no cropping or blurring. These images are as good as sacred and the rules extend to newspapers which always include pictures of the leaders so cannot be folded, torn or thrown in the bin. In a rare departure from the bus we’re taken into the Pyongyang metro. It’s deeper than any other subway in the world supposedly so that the stations can double as nuclear shelters. Most of the trains use old German carriages that were shipped over from Berlin, inside they’re still clad in wood paneling. Our fellow passengers smile and one or two try to talk to us but most keep their eyes down. It’s much the same reaction as commuters on any other subway really. The main difference though is that in any other country 99% of people would be glued to a smart phone. Here we can see only one or two people with them, a luxury for the privileged few. Back at ground level it’s fun to watch the cyclists diligently following the traffic rules that mean they have to use the pavements and then carry their bikes down the steps of the underpass to cross the road. Traffic wardens in smart teal uniforms move like robots waving cars over junctions and occasionally saluting to government officials that drive past, recognisable by the number 727 on their plates. 727 is very important to the DPRK as July 27th was the date of the signing of the armistice at the end of the Victorious Fatherland Liberation War (also known as the Korean War). Everyone walks with purpose, often on their own, it’s as if they need to look busy to stay out of trouble. It’s not all about work for the residents of Pyongyang though. There are several fair grounds, a water park, cinemas and theatres to enjoy during their one day off each week. They have their own tourist attractions too. 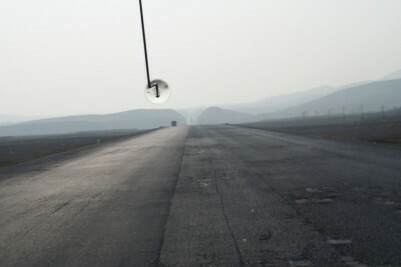 A bumpy major highway takes us away from Pyongyang up to the cave that lucky citizens may be taken to see. For us it’s just another show cave with stalactites and stalagmites that look like things but for a North Korean it must make for a thrilling day out. The highlight for our guide is when she gets to show us various phallic shaped rocks and asks some of the men to point to the one that looks most like their own ‘secret place’. We spend the night in a small town hotel with super-heated beds and a decor straight from 1977. The nearby was out of budget for us and just about anyone else if reports of its high rates and low occupancy are true. 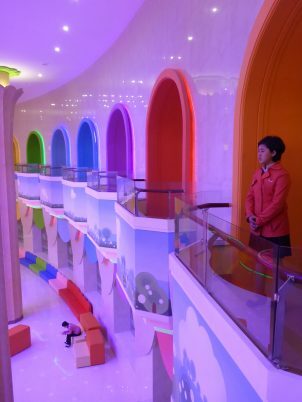 The most expensive rooms are $1500 a night, $300 short of the average annual income in the DPRK. The mountain scenery in this part of the country is very picturesque and it’s not the first time we wish we were on the bike with our tent to be able to fully appreciate it. The restricted view from a bus window is no substitute for the full panorama we get when pedaling although Kirsty appreciates not having my back in the way. Nice scenery to cycle through. If only we could. We’re taken to visit a restored Buddhist temple and a man claiming to be a monk explains some of the history. They have a room full of ancient scriptures printed using thousands of wood blocks. The printed scriptures are here while the blocks are in South Korea and it looks unlikely that they will be reunited any time soon. I ask Mr Pang how many Buddhists there are in the DPRK and he tells me “10,000”. I then ask how many Christians are there? “10,000” is the answer. Officially the country is an atheist state but in reality the leaders are looked on as near deities. They have each written books of teachings and anecdotes that read like religious texts. All citizens wear badges with their images as a constant reminder of their guiding wisdom. Kim Il Sung is the eternal President of the republic, forever always with his people. Temples to the Great and Dear leaders take the form of two vast buildings named the International Friendship Exhibition. They house gifts from international visitors, diplomats and friends of the leaders. Kim Jong Il’s collection is much like a Bond layer, built into the side of a mountain and behind 4.5 ton bronze doors. Inside we’re shown an engraved rifle from Vladimir Putin, a photo of an ostrich that was donated by Robert Mugabe (now living in the Pyongyang zoo (the ostrich, not Mugabe)). Numerous elaborate gifts from Chinese investors including a massive wood carving from a financial institution in Hong Kong. Madeline Albright gave a basketball when she visited. Each of us looks for the section that reprisents our own country and we’re bemused by the UK collection. On a small plinth stands a coffee mug, a replica of the tower of London and a Bristol blue glass coaster. I’m surprised the receipts from the airport duty free shop wasn’t framed next to them. Again the view is fairly bleak as we travel back to the big city. There’s a distinct lack of trees making us wonder how the villagers heat their homes during the harsh winters. A few tractors work the land, more than we’d seen in countries like Cambodia and Laos, but hand tools and ox are more common. Road maintenance seems to be long forgotten making the journey slow and uncomfortable even though we’re on one of the few main highways. A community reforestation project. It looked like the whole town had cycled out to plant trees. There’s been no expense spared at our next stop back in Pyongyang though. The Children’s Palace sits somewhere between Willy Wonkas chocolate factory and a corporate shopping centre. 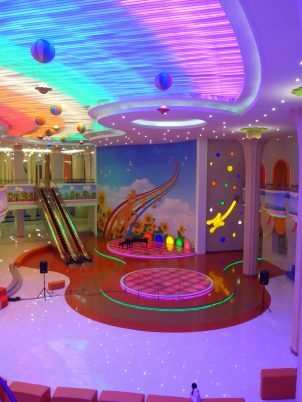 Marble floors and columns are offset by rainbow coloured lighting and garish murals. This is an after school activity centre of massive proportions with rooms full of children showing us their skills. In one a group of girls dance in perfect unison with fixed grins on their faces. We see an accordion lesson complete with a teacher correcting mistakes that we hadn’t noticed. Some incredibly fine embroidery is being carried out next door and along the corridor they’re practicing calligraphy. It’s all very impressive but at the same time a little unsettling. This isn’t how children normally behave at such a young age and the building is just too smart, too clean and tidy. It’s less surprising that in every room the omnipresent faces of Kim Il Sung and Kim Jong Il look after their young prodigy’s. Education of their citizens starts at an early age. Our pre-tour information instructed us that we’d need smart clothing for the visit to the Palace of the Sun. This is the final resting place for Kim Il Sung and Kim Jong Il who now lie preserved and on view in glass caskets. Our limited wardrobe doesn’t really extend to much that could be classed as smart so I have to borrow a shirt and trousers from Troy and become almost unrecognisable. Even the beard gets combed. We’re arranged into orderly lines and led onto a long conveyor that slowly moves us towards the building. Solemn music plays and on the wall there are pictures of the leaders giving expert guidance to food factory workers, military commanders and loyal citizens (fans of the website Kim Jong Il looking at things would enjoy this gallery). The rules state that we cannot walk or lean on the conveyor so we have to stand to attention and wait to be deposited at the end. We walk through several marble lobbies before arriving at the first mauseleum. In groups of 4 we step forward and bow (nod a bit) at Kim Il Sung’s feet, his left side then his right side. The figure in the box looks like a wax work and the red lighting adds to the surreal appearance. The procedure is repeated in another room containing Kim Jong Il and between them we see dozens of honourary degrees, medals and accolades that they’d earned during their life times. The building is vast so seems to be built to accommodate several more generations if the monarchy continues. We gain some understanding of how Kim Il Sung came to be so revered at the enormous Victorious Fatherland Liberation War Museum. A short video with the title “Who was responsible for starting the Korean War?” explains to us how the US launched a surprise attack on the DPRK in 1950, starting the Fatherland Liberation War (also known as the Korean War). Fresh from liberating his country from the Japanese occupation, Kim Il Sung drove back the imperialist US aggression forcing them to sign an armistice in 1953. Your understating of these events may differ but the message is very strong here in the museum: The DPRK were victorious as the US did not win. A captured US navy ship sits on the river nearby and several downed aircraft are proudly displayed with graphic images of the remains of their pilots. As we walk round a group of school children are a short distance behind, enjoying a field trip for their history class. 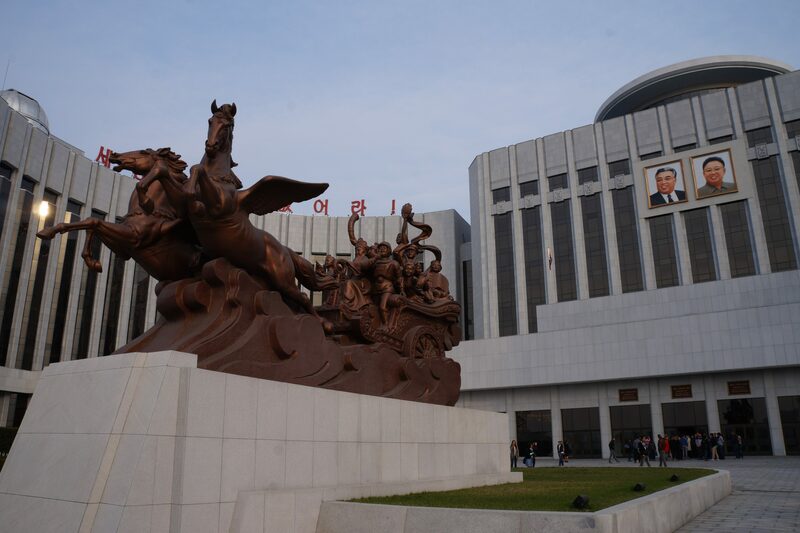 The museum is just one example of how the DPRK are proud of their achievements and endeavours. Another is the recently opened Sci-Tech Diffusion Hub. An atom shaped building that seems to serve as an education centre, a research lab and a science museum. The staff all wear pale green uniforms to make them look more scientific. In the middle of the central atrium stands a huge model of the Kwangmyongsong-4 rocket that reportedly launched the DPRKs first satellite into space earlier this year. There are hundreds of modern computer terminals spread across several floors, all running the state controlled intranet. We see a hand full of boys watching videos on their version of YouTube but most of the seats are empty. Apparantly a DPRK team have been to the Antarctic. The flags in the photos aren’t very convincing though. The science museum area is a fun, hands on type exhibition where you can try out a flight simulator, fire a laser rifle or sit inside a miniature submarine. Before returning to the hotel we visit a real shooting range. The activities on offer include firing a chrome pistol donated by Kim Jong Un himself or taking pot shots at pheasants in a cage with a rifle. One of our group decides to have a go with the rifle and hits one of the birds. It’s like shooting fish in a barrell so it would be hard to miss. He’s presented with the wounded bird in a plastic bag though it seems very much alive so he’s not sure what to do with it. There’s some joking about during which the stunned bird ends up on the floor so I take the opportunity to grab it and see what the damage is. There’s a slight nick on its shoulder but otherwise it looks fine so I unfold it’s wings and release it into the woods. Another DPRK refugee tastes freedom. The Yangakto Hotel is a 30 storey tower on an island in the middle of the river. It’s the main tourist hotel in the city and is our guarded refuge each evening. In the basement there’s bowling, ping pong and karaoke where, after a few beers it’s easy to forget which country we’re in. There’s no mistaking where we are when we switch on the TV in our room and watch a rotund Kim Jong Un overseeing a huge military exercise. He laughs heartily as another wave of missiles can be seen firing into the sea. The DPRK has the fourth largest army in the world and all men must spend 6 years in military service. Another rule that we’ve been reminded to obey is to not take photos of soldiers but it’s very difficult when every other person is in uniform. They’re trained to protect their home, the greatest nation on earth, from their enemies in the south led by the ‘US military aggression’. The tension between the two parts of Korea is never more apparent than at the DMZ. The Demilitarised Zone divides north and south with a 4km wide area of no man’s land stretching 270km across the Korean peninsula. This is the most heavily guarded border in the world and yet once we drive past the concrete walls there are farmers ploughing the fields within the protected belt of land. It’s either one of the most dangerous or one of the safest places to work given the number of guard towers watching over them. In a small building close to the actual line that divides north and south we see the desk that was used for the signing of the armistice. Our military guide shows us a battered UN flag that was left by the Americans after the signing process was over. He tells us that “The flag has faded but US imperialist aggression has not”. Straddling the border itself several blue huts form the Joint Security Area, a place for negotiations between the two sides. We’re allowed into one and can merrily walk from the DPRK to the ROK (republic of Korea) by skirting round the negotiating table. This is the only place where we can cross the border and it’s only for a few minutes before we’re ushered out and back onto the safety of DPRK soil. The Joint Security Area. The large building behind the huts is in South Korea. Kirsty sits in DPRK, Marcus is in ROK. The centre of the table is the border line. Not far from the DMZ is Kaesong, a city that used to be in the south but found itself in the north as a result of some border adjustments after the war. Many families were divided and for years lived in hope that this was just a temporary arrangement and they’d be reunited again. Like that battered UN flag, their hope must have faded now. One nation again one day? The long journey back to Pyongyang is livened up by singing and jokes on the microphone and a highly entertaining performance from Mr Pang. There’s more singing from the waitresses at dinner then we’re treated to a private viewing of ‘Order 027’ at a local cinema. This is a classic DPRK production featuring plenty of tae kwon do, and some inspired dialogue. “You must meet agent pomegranate at 0900 hours….”. The highlight however is that one of the actors joins us to introduce the film and answers a few questions. From Miss Kim’s swooning it’s clear that he’s quite a big deal here so we’re privileged to be able to meet him. The final day of our trip is also Kim Il Sung’s birthday: the Day of the Sun. All week we’ve seen groups practicing performances, buildings being painted and repaired and flags being unfurled in preparation for this day. We climb to the top of the Juche Tower to view the city from high. Juche is Kim Il Sung’s ideology that the country is governed by. It takes elements of communism and adds an ethos of total self reliance which explains their strong desire to stay closed off from the rest of the world. The Korean Workers Party is symbolised by the hammer and sickle but with the addition of a writing brush to indicate the importance of intellectuals alongside the workers and farmers. The Juche tower, the tallest stone tower in the world. A flower show of Kimilsungia, a plant specifically developed for the Great leader. It’s a national holiday so everyone is out enjoying the sunshine in the park. There’s more music and dancing which we get pulled into by some excited old ladies. Families are picnicking and wave at us with big smiles. During the week it’s been interesting listening to everyone else’s views on what we’ve seen. There are a few Americans in the group who understandably feel intimidated by the strong anti-US language. Agie and Philip were born in Poland and, like Tom could see similarities with their communist upbringing although here things are much more extreme. Most interesting of all though is the conversion we have with Sarah who is South Korean but now lives in California. She was always taught to be fearful of her neighbours in the north and for the first few days didn’t want any of the guides to know she could speak Korean. The more she saw though, the more she realised it was a different place to what she expected. Once she began speaking to some of the locals they were thrilled to meet her and hugged her as their sister from the other side. Reunification is still the dream for most people in the DPRK and they long for the day that Korea is one country again. The Day of the Sun ends with a huge firework display over the Juche Tower. We have more freedom here than we’ve had all week and mingle with the crowds. Once it’s over a man next to me quietly asks where I’m from but without wanting to make eye contact. I tell him I’m from England and he replies by saying “very good”. I want to talk more but he soon disappears into the dark and the crowd. Perhaps that was as much of a conversation as he could risk. The train takes us back towarda Dangdong the next day. There’s another lengthy wait at the border while a few cameras are checked but it’s not as thorough as we expected. This time the guards entertainment is provided by a video clip of one of the YPT guides dancing in his pants that was found on someone’s phone. We never expected China to be somewhere that would feel so free but being able to walk out of the station unaccompanied, to cross the crowded street, to take photos of whatever we like feels amazingly liberating. Instead of the portraits of the Kims there’s the face of Colonel Sanders on the side of a KFC. All week the small matter of getting a visa to get out of the DPRK had been playing on our minds. Luckily Pyongyang is one of the easiest places to get a Chinese visa so with the help of miss Kim and an agent some new 7 day transit visas were bought and stuck into our passports by the embassy. We were free to go and breath a sigh of relief. There’s no other country quite like the DPRK and to have been able to visit it has been a remarkable experience. Our thanks go to Troy and the YPT team for laying on such a full and enjoyable week. Our guides, Miss Kim x 2 and Mr Pang worked tirelessly and managed to keep us all informed, entertained and out of trouble. We’re leaving the country with a new set of friends from around the world too. There’s clearly a lot more going on behind the closed doors we weren’t allowed to open and we’re leaving with many more questions than answers but as weeks go this has been one to remember. As always, there are plenty more photos in our North Korea Gallery here. Absolutely brilliant and fascinating if a little weird. That’s some mixed up country and you just can’t figure how it can last like that. Hope you’re enjoying your travels and always look forward to your blogs. It has to come to an end one day but it’s going to be one hell of a mess to sort out and no one is going to want to foot the bill. Glad you’re still enjoying reading my ramblings! Hope it’s all good in BoA. What an interesting and fascinating read!! Thank you for sharing with us! Thanks Julie, glad you enjoyed it!